You may joke about doggy’s nasty breath or kitty’s drooling. But, these behaviors and characteristics may be symptoms of (or lead to) serious conditions. A wellness and prevention focused practice, San Marco Animal Hospital in Jacksonville, FL takes pet dental care very seriously. Drs. Gutta and Sri combine professional cleanings and exams with education. You benefit from dental visits; consider how your furry family member benefits from active professional and home care, too! 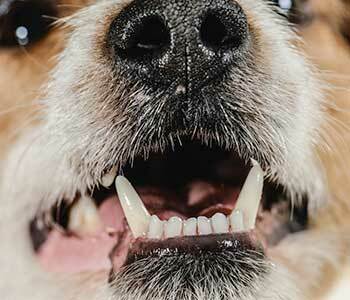 Tooth decay isn’t as much of an issue among dogs and cats. But, like people, pets can have breakage, infections, misalignment, cysts, jaw fractures, and palate-related defects. Similarly, periodontal or gum disease is the most common dental condition affecting dogs and cats. The American Veterinary Association reports most pets develop gum disease before their third birthday! Bacteria form sticky plaque that, if not removed adequately, hardens into stubborn tartar. Hardened plaque above the gum line is obvious. The real problem is underneath the gums; bacteria excrete acids, which damage supportive tissues and contribute to tooth loss. Your pet’s white blood cells defend against these bacterial invaders; however, the chemicals released as an immune response can actually make the disease worse. If disease remains untreated, damage to the oral cavity can occur, such as holes or fistulas associated with nasal discharge, fractures caused by weakened jaw bone, and bone infections. The American Veterinary Dental College reports studies have shown gum disease causes microscopic changes to the heart, liver, and kidneys. As with human patients, pets with early-stage disease may be asymptomatic. By the time problems are noticeable, disease may have already progressed to the point where extractions are required. This underscores the need for regular professional dental care and home care in-between visits. Oral exams at San Marco Animal Hospital include a thorough evaluation by your vet and gentle, safe digital X-rays to determine the health of the jaw and tooth roots under the gum line. Most dental disease develops under the gums where you can’t see it. 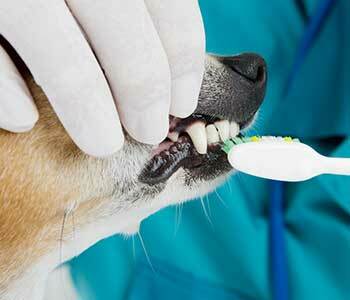 Anesthesia is required to appropriately clean and assess your pet’s oral health. Unlike you or your human family members, pets don’t understand the benefit of proactive dental treatment. They’ll react by fidgeting, trying to escape, or biting. Anesthesia makes treatment more comfortable and a more pleasant experience for your pet. It also allows for diligent cleaning and prevents the risk of your pet being injured by dental instruments in the event that he or she flails around on the treatment table. The benefits of treatment far outweigh the (very low) risk from anesthesia. Cleanings involve using an ultrasonic scaler to remove dental plaque and tartar, followed by polishing that removes residual plaque and smooths the tooth’s surface. The mouth is rinsed, and recommendations are made for oral hygiene specific to dogs and cats, and for follow-up visits. Owners who have a habit of cleaning their pet’s teeth frequently are likely to note changes that require immediate treatment, such as evidence of oral tumors. Early detection is the best defense, just as prevention is the best medicine! For both dogs and cats, brushing is the single most effective way to keep mouths minty-fresh and healthy between visits. For dogs: Almost all accept brushing. Start with the outsides of the “cheek teeth,” under the upper lips. Those that resist frequent brushing may have painful areas that need to be examined and addressed. Rawhide and chew treats can be helpful if used consistently, but the AVDC doesn’t recommend hard nylon or dried natural bones that can break teeth and damage gums. For cats: Require a gradual and gentle approach. Start with a pet toothpaste in a flavor kitty likes, such as seafood. Let your pet lick the paste off your finger and, later, off of a small feline brush or finger-brush. Eventually, place the brush in your cat’s mouth and add brushing motions. 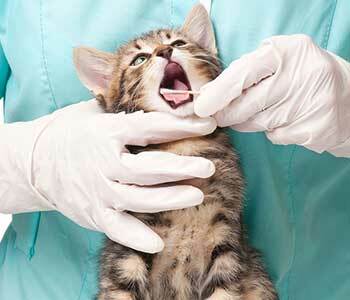 Your cat may tolerate dental rinses, gels, or tooth-friendly diets. While treatment for gum disease varies, all pets can benefit from ongoing dental checkups and home care. Call 904-399-5557 to schedule your pet’s visit. Ask about San Marco Animal Hospital’s affordable wellness plans!